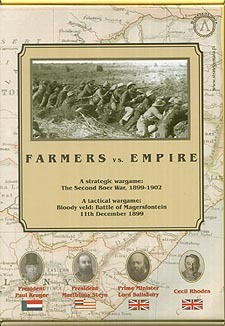 The Second Boer War is a game describing the whole struggle during the Second Boer War (1899-1902), during which the two Boer Republics (Orange Free State and Transvaal Republic) fought for independence from the British Empire. To capture the variable nature of the war, the game consists of four stages - the first two reflect the regular phase of the war (clashes of organised armies on both sides), the other two the guerilla war. The differences in the phases affect mechanisms of using the military units and resolving the battles. Counters represent all major commanders of the war, clashes are resolved using special cards. Bloody veld is a tactical wargame describing one of the most famous battles of the Second Boer War - the Battle of Magersfontein. The battle took part during the march of a taskforce of the British 1st Infantry Division under General Paul Methuen towards Kimberley and ended in victory for the Boers through thought-out tactics and tough defence. The game takes into account the specific conditions in which the battle was fought (flat, almost devoid of forest cover area with the prevailing Magersfontein elevation), the armament used by both parties (repeating rifles, automatic cannons, long range and accurate field fire guns) and tactics. The Boer player uses the trenches to protect him from the fire of the British infantry and guns (only howitzers and naval artillery is dangerous for the trenches). The Boer player uses masking counters to hinder the enemy fire. The Royal Engineers balloon section (used for reconnaissance and direction of artillery fire), also takes part in the battle. The participation of volunteers from Europe gathered in the so-called Scandinavian Corps also adds flavour to the game. Move therefore, Dear Player, to battle for the strategically important hill. You decide the fate of hundreds of civilians in Kimberley or freedom of the African homeland!